What is Content Marketing? The Top 10 Found Definitions. Businesses are hearing more and more about content marketing. With everyone glued to their smart phones it really is no wonder that content is being devoured on a daily basis. According to Social Media Examiner, "Blogging holds the top spot for future plans: A significant 68% of marketers plan on increasing their use of blogging, making it the top area marketers will invest in." So, it is time to take a look a what this is all about. We have compiled a list of the best, most poignant definitions of Content Marketing. Please take a look and lets us know if we are missing any of your favorites! "You’ve just heard someone mention “content marketing” and you get the idea you should already know what it is, but you’re too embarrassed to ask anyone. Congratulations, this post is for you." This intro just made me chuckle. Defintely a great article for some solid examples of content marketing. "Content marketing is any marketing that involves the creation and sharing of media and publishing content in order to acquire and retain customers. This information can be presented in a variety of formats, including news, video, white papers, e-books, infographics, case studies, how-to guides, question and answer articles, photos, etc." We definitley cannot leave wikipedia out! "Today’s business buyers do not contact suppliers directly until 57 percent of the purchase process is complete. Do you want them to find information about your business? Or do you want to leave a empty space that either your competitors will fill with their own helpful content, or your would-be customers will fill with damaging complaints or feedback on your organization?" Content Marketing is all about being in the right place at the right time when a potential customer is looking for your services. >> Considering adding content marketing to you website? Learn how to streamline your website redesign with this 11-step checklist. "It is a strategy of producing and publishing information that builds trust and uthority among your ideal customers. It is a way to build relationships and community, so people feel loyal to you and your brand. It is a strategy for becoming recognized as a thought leader in your industry." This is the most thorough, step-by-step content marketing guide I have ever seen. 100 kudos to the content writer and the creative team. "One of the most effective new marketing approaches out there is content marketing. According to the Content Marketing Institute, over 85 percent of brands use it, but less than half believe they're good at it. 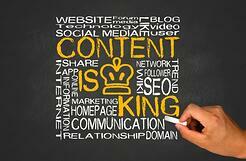 In many ways, content marketing is even more important for small businesses." Less than half believe they're good at it? Maybe they are not using the proper metrics? "Content marketing strategy isn’t a nice to have, it’s a requirement. Recent research from the Content Marketing Institute found that more than 80% of B2B marketers say they have a content marketing strategy, but only a third have documented that very same content marketing strategy. Let’s fix that." Jay highlights the importance of having a strategy for your content. The strategy needs to be based on what your customers are interested in. "Content marketing consists of top-notch content, written for humans, and using the keywords that you’re targeting." Love how you explain how SEO states requirements and content fills them. Very insightful. "Content marketing is the publication of material designed to promote a brand, usually through a more oblique and subtle approach than that of traditional push advertising. The essence of good content marketing is that it offers something the viewer wants, such as information or entertainment. " Check out the video on the history of content marketing here. Content marketing has been around for longer that most people think. If you do not want you business to be left behind in the sea of content, we would reccommend developping a content marketing strategy before it is too late.